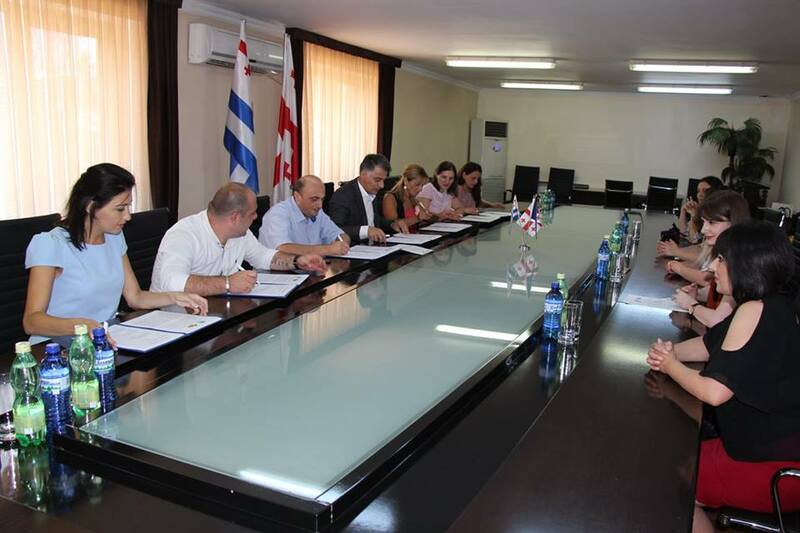 On 18th of July, six Women’s Rooms (WRs) of Ajara region have expanded their linkages by signing a Memorandum of Understanding (MOU) with the Ministry of Health and Social Affairs of Ajara Autonomous Republic. The Ministry will use the Women’s Rooms to reach the rural population though disseminating information and organizing meeting on the health-care programs implemented by the Ministry via WRs. “The Women’s Rooms in Ajara have already increased women’s involvement in local self-governance. The participation of rural women in social projects is also very important, so we are glad to cooperate with this municipal services to involve more people from rural areas and ensure the proper dissemination of the information about the programmes,” - Zaal Mikeladze, the Minister of Health and Social Affairs. Finally after years of waiting punctuated by the protests of desperate rural inhabitants who have at times blocked it to highlight their plight, the Batumi-Akhaltsikhe central road, which from the top of the Goderdzi pass to Khulo is little more than a dangerous track, is to be constructed into a proper road. The Kuwait Economic Fund has signed MoU with the Government of Georgia to help with rehabilitation of the road. The funding for the project (which is estimated at 100 million GEL) has been received as a state loan to be approved by the Parliament of Georgia soon. Rehabilitating The road, which can be justly claimed one of the most beautiful in Georgia, will immediately enhance the lives of rural inhabitants not just in quality of life but in as a boost to livelihoods as even in its current condition the road is a vital trading link between Ajara, Samtskhe -Javakheti and Kvemo Kartli as illustrated by the fact sheets. 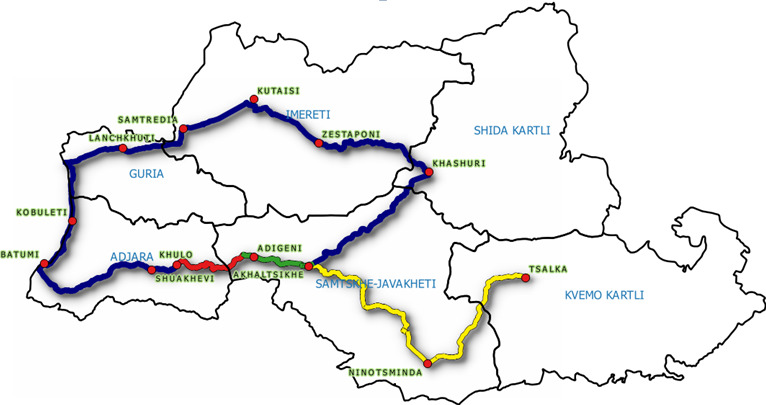 Map: red one is Batumi-Akhaltsikhe Road and others are the longer routes. The first Cheese Factory in Ajara, Natural Produktsia Ltd was officially opened in Dioknisi, Khulo Municipality. Construction of the factory started in April, 2015 and has been functioning since October. Natural Produktsia Ltd is the first and only cheese factory in upper Ajara producing Imeruli cheese currently at the largest scale in Georgia. The factory is set up with modern equipment and is producing cheese in accordance with FS&H standards. The factory collects milk from 22 villages of Khulo municipality from more than 300 farmers to date, who have now have a source of daily income. The factory processes up to 6 tons of milk daily and makes Imeruli cheese, Sulguni cheese, cottage cheese and butter. It employs 23 local farmers, out of which 11 are women. The factory is the sister factory of the family enterprise Tzesari Ltd whose factory in Sakdrioni village Tsalka produces sulguni which is sold in Carrefour in Tbilisi and in the Batumi Agrarian Market, leading hotels, such as Hilton, Sheraton, Radisson; restaurants - Porto Franco, Munchen, Pier Batumi, Riviera; supermarkets like Goodwill, Nugeshi, Nikora, Ialchin, Willmart, Absolute, etc. Djakhangir Abasov, 2500 sheep owner from Sagarejo municipality: “It is very good and almost unbelievable that we’ll bath our ship and cattle for free. We were paying to private owners 0.5 Tetri per sheep which is 100-150 GEL for a flock plus money for the chemicals”. Over the last 18 months, programme client Agricultural video producer Mosavali has been developing technical video lessons on key aspects of livestock husbandry and beekeeping. The videos pitched at reaching farmers through social media and no longer than 3 minutes viewing time have taken off. 9 livestock and 7 beekeeping videos have been produced and uploaded to networks. The participation of Alliances Lesser Caucasus Programme at DCED Global Seminar was highly appreciated and named within the top 3 seasons of the event by the attended audience. The seminar on the Standards for Results Measurement was hosted by DCED in Bangkok from 14 to 16 March 2016. Women's economic empowerment, assessing attribution, measuring job creation, and using results information to manage programmes – were the main topics of presentations and discussions featured on the seminar. 130 participants from 38 countries, representing 52 organizations, field programmes and donor agencies gathered for the information exchange, for deepening understanding of DCED standards and for participating in plenary discussions on cutting edge themes. ALCP photo won in the photo competition on Private Sector Development announced by DCED. Photo is taken in programme financed Wool Collecting Center and it was listed among 5 winners in condition of high competition. Winning photo will be displayed on new DCED website, visited by more than 60,000 unique users per year, and materials printed for high-profile events and publications. It will also be shown at the DCED Global Seminal in Bangkok.